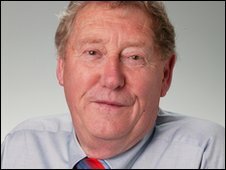 Labour MP Austin Mitchell has said he regrets taking part in a TV show which he claimed set out to "humiliate MPs". He said he appeared in Tower Block of Commons, in which four MPs live on some of Britain's most deprived estates, "to put the case for council housing". But Mr Mitchell said he was portrayed as "greedy and out of touch", adding: "I should never have fallen for it." Love Productions said it was "surprised" by his views and "certainly did not set out to humiliate the MPs". The other MPs who took part were Lib Dem Mark Oaten, and Conservatives Nadine Dorries and Tim Loughton. Ms Dorries replaced former Tory leader Iain Duncan Smith, who pulled out when his wife was diagnosed with cancer. Mr Mitchell, MP for Great Grimsby, said production company Love Productions pitched the show to him on the basis that it would "show what a dirty deal councils tenants get". "I should have turned them down. All the smarter Labour MPs did," he wrote. "Naively I accepted. Here was a chance to put the case for council housing. "Big mistake. Love didn't want to plead for improved conditions for council tenants but to humiliate MPs. "It's easy to show us as greedy (although they didn't pay us), out of touch (though we knew more about the people than them) and incompetent (almost as much as their production techniques). They duly did so. "So five MPs - and particularly me - were allowed to make fools of ourselves." Mr Mitchell claimed MPs were "briefed against" in press releases for the programme resulting in "a deluge of abuse about MPs but nothing said about the neglect of council estates". "A disgrace. To Channel Four for putting it out. To Love for its cynical distraction of the real story. To me for taking part in the first place." Mr Mitchell worked as a television journalist before he became a Labour MP in 1977. Love Productions, which made the show, said it had not received any complaints from the MPs and insisted they "were not misled as Austin claims". "There's been a dialogue with MPs throughout production, all of whom have viewed the programmes before transmission, to ensure they fairly reflected what happened," it said in a statement. "Love and Channel 4 cannot be responsible for what others write about the series, and neither Channel 4 nor Love Productions briefed the press as Austin Mitchell suggests. "We certainly did not set out to humiliate the MPs taking part and we don't believe the end result does so." In a statement, Channel 4 said the four MPs "responded in a variety of ways" to the show. "Living on some of the UK's toughest council estates was personally challenging for each of the four MPs who took part in Tower Block of Commons and as such they all drew different conclusions from the experience."